Quickly, name a luxury car brand. Many of you probably thought of some German manufacturers like Audi, BMW, or Mercedes-Benz. Some may have stuck with American engineering and said Cadillac or Lincoln. You may have even gone into the Asian market and thought of Lexus. However, believe it or not, a lot of the best luxury comes from Great Britain. Jaguar, Aston-Martin, Bentley, and Rolls-Royce all come from the English isle. After all, four different James Bonds can’t be wrong, can they? We’ve delved into the archives of Car and Driver, Consumer Reports, Edmunds, and Motor Trend, to bring you the list of the best British cars for the 2010-2011 model years. 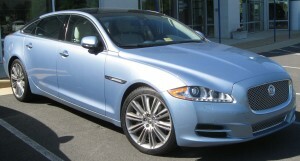 Despite its hefty price tag, the XJ is actually a bit of a bargain compared to other top British models. It’s only when you jump up to the Supersport models that you see a significant price increase. However, if you’re willing to spend the extra cash, you can jump from the standard 5.0L V8 to the supercharged V8, which is good for 510 horsepower and 461 lb-ft. of torque. Even with the added power you’ll get a combined fuel economy of 18 mpg. There aren’t many vehicles that can match the XJ’s balance between comfort and overall ride quality. It is deceptively agile and provides excellent response in both handling and acceleration. Trunk space is average and the back seat is rather cramped, but interior materials quality is superb. The Ghost is brand new, being unveiled in the 2010 model year. For those unfamiliar with Rolls Royce engineering, this one is loosely based on the BMW 7 Series. It is one of the most powerful of the group, possessing a 6.6L V12 engine pushing 563 horsepower and 575 lb-ft. of torque. That power is distributed by an eight-speed automatic transmission, and will go from zero to 60 mph in just 4.7 seconds. 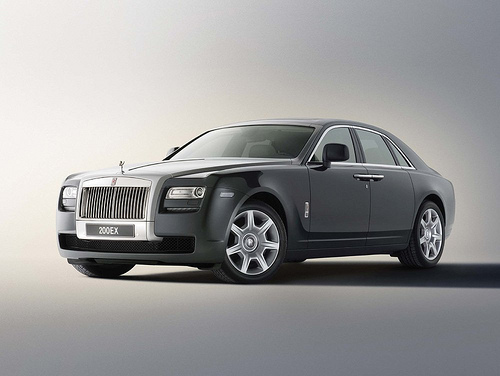 Since Rolls has never been known to sell vast amounts of production models, it may be difficult to get your hands on one of these. 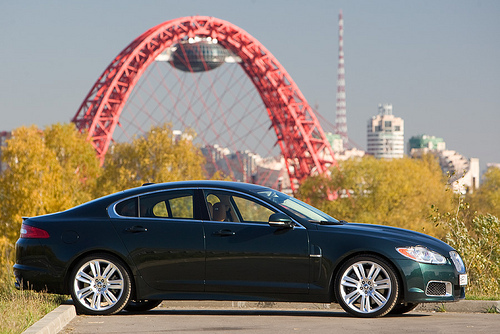 The 2010 model’s 4.2L V8 has been replaced by a stronger 5.0L V8, which caused Jaguar to upgrade to larger brakes and a sportier suspension, but there weren’t many other changes to the XF XFR. The addition of a heated windshield is a nice touch for those in inclement climates. Fuel efficiency is not bad for an eight-cylinder at 16/23 mpg (city/highway), but the supercharged XFR will drop those numbers slightly. The ride is comfortably hushed and grip around the corners is glue-like. Steering can be numb at times but the firmer suspension does add a touch of sport to the driving experience. “The idea of a four-door sports car has been discussed for ages, but the 2011 Aston Martin Rapide truly lives up to the billing.” (www.edmunds.com) The 6.0L V12 won’t give you much in the way of fuel efficiency but it will provide 470 horses and 443 lb-ft. of torque. The automatic transmission is extremely smooth shifting up or down, and the steering is tight and nicely weighted. Obviously with this price tag interior luxury is at a premium, but owners should be mindful of the low-slung body in the front. High curbs or driveways will be a definite nemesis to this one.